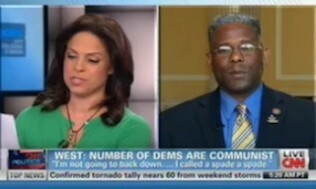 (Mediaite) -- On Thursday’s Starting Point, CNN’s Soledad O’Brien held Florida Republican Congressman Allen West‘s feet to the fire over his allegations that up to 80 members of the House of Representatives were Communists. A visibly uncomfortable West squirmed as O’Brien demanded he start naming names. “Oh, we don’t have to…” West countered. “You can go look up the progressive caucus…” interrupted West. “I got ‘em right here!” O’Brien interjected — and seemingly out of thin air pulled out a list of the members of the Congressional Progressive Caucus. “When then you’ve got the names,” West said. “Tammy Baldwin is a communist? Judy Chu is a communist?” O’Brien continued. “You can call it whatever you want,” West replied. “Yeah, but I want to know what you’re calling it,” O’Brien said. O’Brien then read a statement from the Vice Chairman of the National Communist Party who said West was wrong for calling his colleagues communists. “I don’t care what he says,” West said bluntly. That it? The mainstream coverup? Now it is out! So, it seems and appears that they think they can brainwash Americans. This is a fine example of a Female Tool!